Perspectives: Y.Z. Kami," now on exhibition at the Arthur M. Sackler Gallery, is itself a meditation -- a meditation in three paintings, big ones from New York. 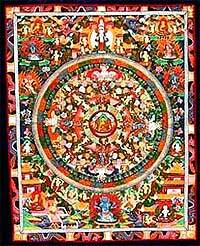 Shanghai, China -- Exquisite Tibetan thangkas by a renowned old family of pious Lhasa painters are on display. Part of the sale proceeds will benefit an orphanage outside the capital of the Tibet Autonomous Region, writes Wang Jie. In painting a thangka, Tibetan Buddhist devotional art, a pious heart is said to be more important than technique because Buddha will inspire and guide the artist's hand. A combination of extraordinary piety and skill are displayed in the 30 thangkas at Shanghai High Noon Art and Culture Center in Pudong. All the works have been created by a famous - but not publicly identified - family in Lhasa that has been painting thangkas for centuries, says curator Zhang Xi. The family supplied some of the painters who decorated the Potala Palace when it was built, he said, but did not say when. The original structure was built in the 7th century AD; it has been rebuilt and expanded over the centuries. Some of the sale proceeds will be donated to an orphanage with 83 children, including a two-month-old baby, in the suburbs of Lhasa, according to the curator. A new exhibit of Tibetan art in Berlin offers a rare chance to see treasures from ancient Buddhist monasteries, but is also being criticized as whitewashing China's treatment of Tibet's ancient culture. Curator Jeong-hee Lee-Kalisch said the exhibit at the Museum of Asian Art was a unique opportunity to see masterpieces that are not found in other museums. 'There has never been an exhibition in which the objects came directly from the monasteries in central Tibet. In that sense, this is a world premiere,' Lee-Kalisch said. The exhibit, which runs through May 28, consists of about 150 works, many of which have never left Tibet. They were gathered from the collections of five monasteries, two museums, the now-exiled Dalai Lama's Potala Palace in Lhasa and his summer palace in Norbulingka. Where did this statue originate - and when? It's a mystery. And where is it safe now? All of us are watchers – of television, of time clocks, of traffic on the freeway – but few are observers. Everyone is looking, not many are seeing. If we study Japanese art, we see a man who is undoubtedly wise, philosophic and intelligent, who spends his time doing what?... He studies a single blade of grass.